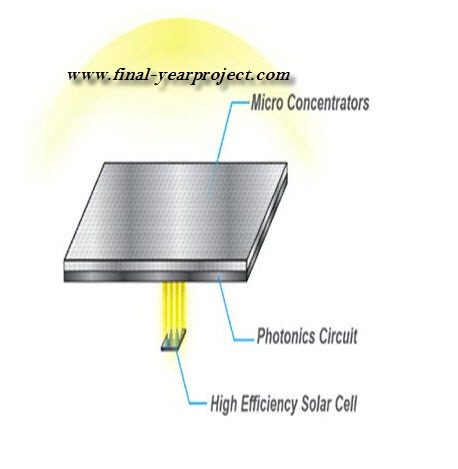 This is a good Solar project on Hyper Solar Concentration Layer and Moth Eye Anti-Reflection Coating for engineering students who want to make project or seminar in Solar Energy. This paper aims at highlighting the aim, functioning, advantages and drawbacks of the hyper solar concentration layer and moth eye anti reflection layer that have been recently developed. You can also Subscribe to FINAL YEAR PROJECT'S by Email for more such projects and seminar. The hyper solar concentration layer is a revolutionary concept and it can genuinely bring about a steep reduction in the solar power generation cost. Moth eye anti reflection coating are Simple and scalable spin-coating technique that enables wafer-scale production of colloidal crystals with nonclose-packed structures. Thanks to the Author for the project report and use it only for your study work.